"The two teams must wear colours that distinguish them from each other and also the referee and the assistant referees." I've noticed over the past few seasons in the Premier League, that when teams play each other, they sometimes now seem to be able to play in kits of similar design. For example, both teams might wear vertically striped shirts with one of the colours being white. This is very annoying for those people like me who suffer from some degree of colour blindness. This never used to be allowed in years gone by. Teams would always wear clearly opposing colours and designs. For me, when I'm watching a match on television (especially if it's on a not-so-decent TV in a pub) - the view below is the kind of quality you're looking at. And this particular image is fairly close in. The default camera view in a match (the side view) is much wider angle. And if you are actually watching in a stadium from up high, it's even more tricky. Can you immediately, and without hesitation identify all the Newcastle players at a glance? If you can, then you have better eyes than me! I don't understand why this has crept in to the game. Who the hell is running football? Just use some common sense! Newcastle vs Stoke - Similar shirts. This should not be allowed! 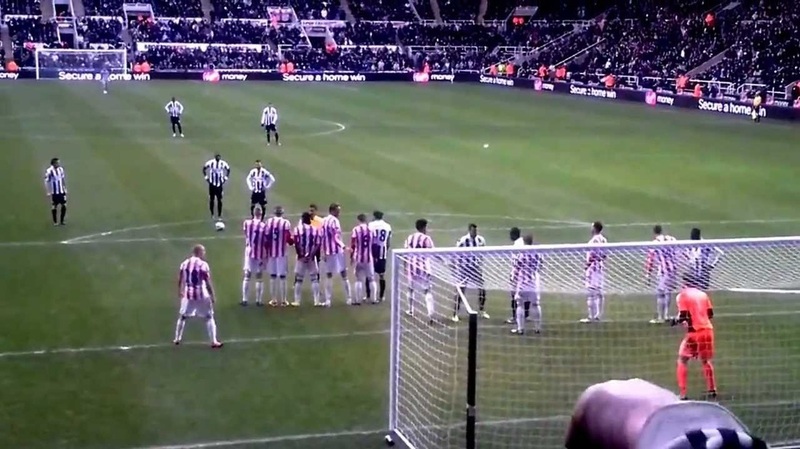 Newcastle vs Stoke: Different short colours, but why are both teams allowed to wear vertically striped shirts? This should not be allowed and is so easy to prevent!